Every holiday season, Yonge-Dundas Square gets into the festive spirit with one of Toronto’s most beloved holiday traditions, Illuminite. 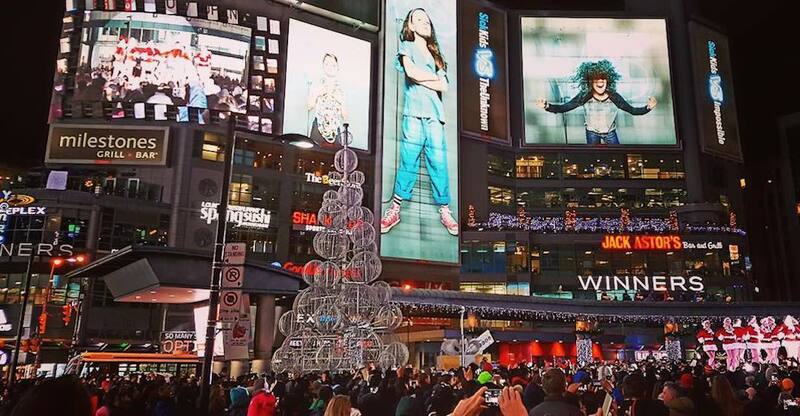 Now in its 11th year, Illuminite will take over Yonge-Dundas Square on Saturday, November 17 with its annual tree lighting ceremony. Each year, Illuminite features an incredible evening filled with dance performances, light shows, acrobats and of course, the ceremonial lighting of the square’s 40-foot tree which glows with more than 52,000 LED lights. There will also be a number of 3D-illuminated polar bears and other unique holiday lighting installations. Illuminite will kick off with a performance from the Devin Cuddy Band who will get the party started, followed by the incredible tree-lighting show from TDC Entertainment. Then guests can join with thousands of others in the square and sing some holiday favourites led by Toronto crooner Ori Dagan. If you have yet to get into the holiday spirit, you definitely will at Illuminite.